Donald Trump faced greater restraints on his presidency after Democrats won control of the US House of Representatives and pledged to hold the Republican accountable after a tumultuous two years in the White House. Trump and his fellow Republicans expanded their control of the US Senate in Tuesday's midterm elections, following a divisive campaign marked by fierce clashes over race and immigration. 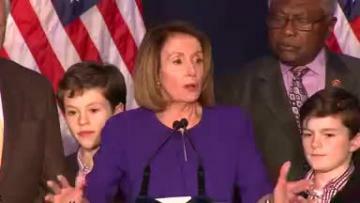 Pelosi declares victory in the US House. Despite his party's poor showing in House elections, Trump wrote on Twitter, "Tremendous success tonight." Trump - a 72-year-old former reality TV star and businessman-turned-politician - had hardened his rhetoric in recent weeks on issues that appealed to his conservative core supporters. He threw himself into the campaign, issuing warnings about a caravan of Latin American migrants headed to the border with Mexico and condemnations of liberal American "mobs" he says oppose him. The party with the presidency often loses seats in the House in midterm elections. Former President Barack Obama's Democrats suffered what he called a "shellacking" in congressional elections in 2010. But House Democrats are expected to try to harden US policy toward Saudi Arabia, Russia and North Korea, and maintain the status quo on areas like China and Iran. 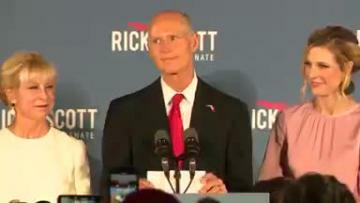 Forida Republican Governor Rick Scott declares US Senate victory. Democrats could make life difficult for Trump by launching another congressional investigation into allegations of Russian interference on his behalf in the 2016 election. The Democrats are awaiting the result of an ongoing federal probe by US Special Counsel Robert Mueller into Russia's role in that election. Voters between the ages of 18 and 34 backed Democrats by 62% to 34%, up from 2014 when 54% backed Democrats and 36% supported Republicans. Hispanic voters favored Democratic House candidates by 33 percentage points - higher than the 18-percentage point gap that Democrats enjoyed in 2014, the poll found.